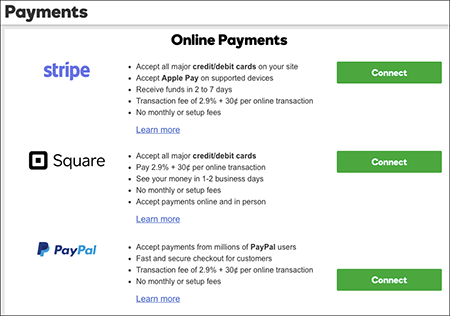 You can set up Stripe, Square, and PayPal payments for your Online Store as part of the eCommerce plan. But all plans (except Personal) let you add a PayPal button for a donation or single item. Square is only available for customers in the United States, United Kingdom, Canada, and Australia. Required: For each payment method, you'll need to sign in to an existing account or create one. In the Manage Store pane, click Open. In the top bar, click Store and choose Payments. Follow each website's prompts to set up or enable the selected payment method. Note: After you connect a payment method, you can change its account settings by returning to this panel and clicking View Dashboard. Or remove an account from your store by clicking Disconnect. To see the Apple Pay button for your Stripe account, go to your published store on an Apple Pay-enabled device and view a product page, which will show how the page appears to customers. 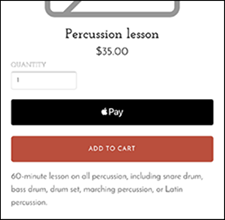 Note: The Apple Pay button also appears in the checkout page. Can I add Braintree's payment method to my website builder?